It’s about this time every year that I start craving fresh vegetables. Between all the holiday food, football food, and generally heavy, slow cooked winter dishes, I need something light and fresh! Unfortunately a lot of fresh produce is out of season in February, so it’s hard to get that fresh flavor I crave affordably. 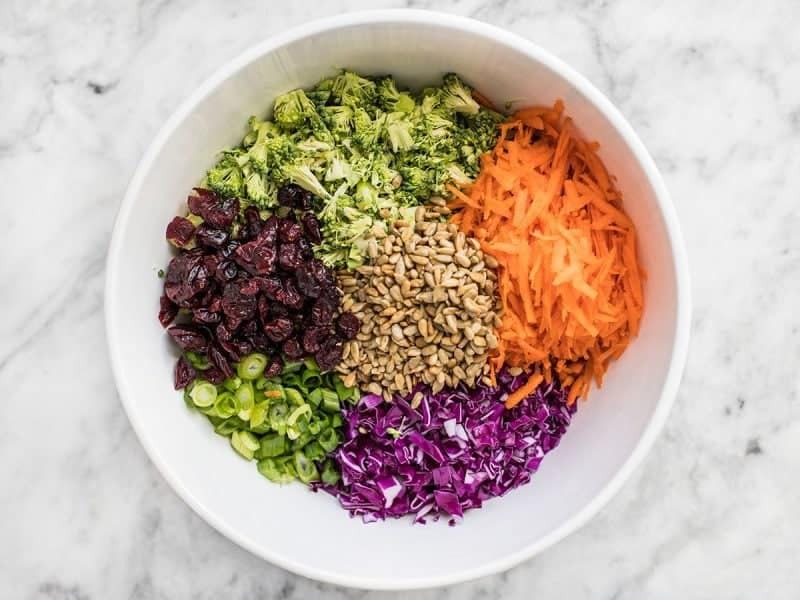 So, I turned to my “hardy vegetables” this week and made a colorful, super crunchy chopped salad with a sweet and savory tahini based dressing. 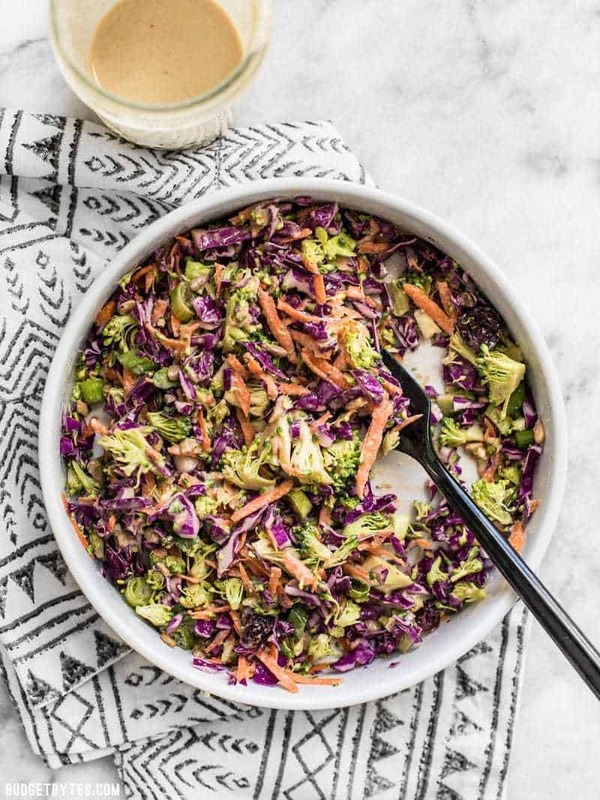 This Sweet Crunch Winter Salad is half salad, half slaw, and 100% deeelish! 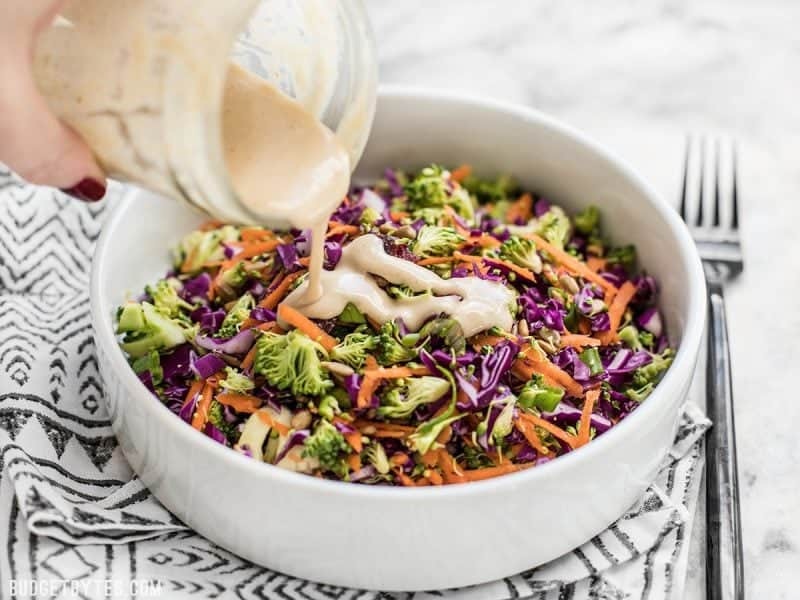 If you like my Lemon Tahini Dressing from my Roasted Cauliflower Salad, you’ll probably like the Maple Tahini Dressing I made for this salad. It has the same base flavors, but I made it a little sweeter with the addition of a touch of maple syrup and I toned down the garlic by using garlic powder instead of fresh garlic cloves. If real maple syrup is out of your budget, you can substitute honey or agave syrup in its place, although maple has a wonderfully deep flavor that I love as a compliment to the tahini. I use maple syrup very sparingly and it lasts pretty much forever, so this is one of those ingredients where a high price tag can be justified. When fresh vegetables are in short supply, make this Sweet Crunch Winter Salad packed full of winter vegetables and a homemade Maple Tahini Dressing. To prepare the dressing, combine the tahini, water, lemon juice, maple syrup, salt, garlic powder, and cayenne in a bowl or jar. Whisk the ingredients together, or place a lid on your jar and shake until incorporated. Set the dressing aside. Finely chop the cabbage and broccoli, then place them in a bowl. Peel and shred the carrot and slice the green onions. 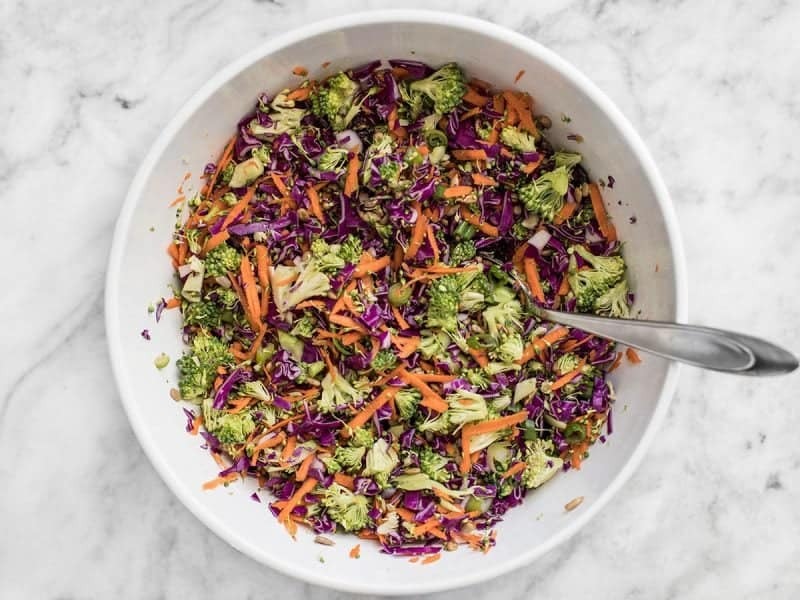 Add the carrots, green onion, sunflower seeds, and dried cranberries to the bowl with the cabbage and broccoli. Stir until everything is evenly combined. This mixture can be refrigerated for 4-5 days, undressed. To serve, drizzle the dressing over the salad mixture and then stir until everything is well coated. You want to use a generous amount of dressing, making sure everything is liberally coated, similar to a coleslaw. Begin by preparing the Maple Tahini Dressing. 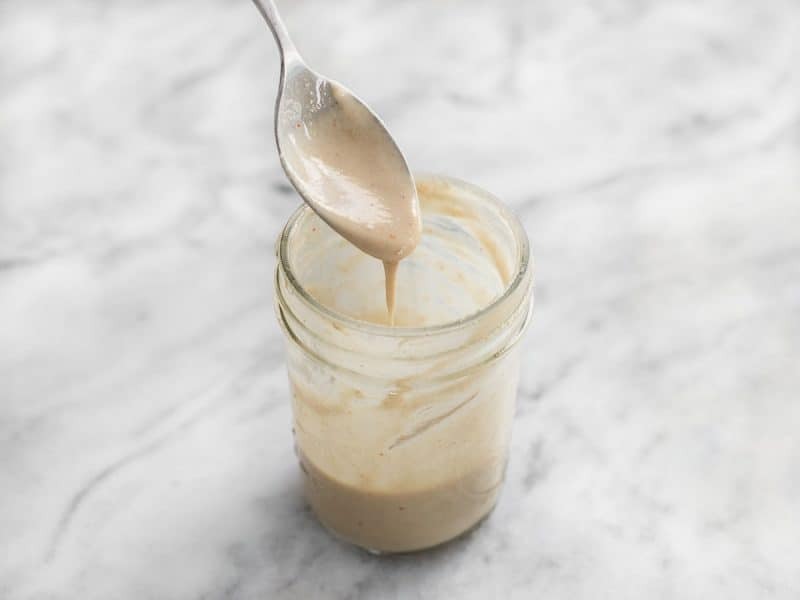 In a bowl or jar combine 1/4 cup tahini, 1/4 cup water, 2 Tbsp lemon juice, 1 Tbsp maple syrup, 1/4 tsp salt, 1/4 tsp garlic powder, and a pinch of cayenne pepper. Shake or whisk until the ingredients are incorporated, then set the dressing aside. These are the vegetables I used for the salad. 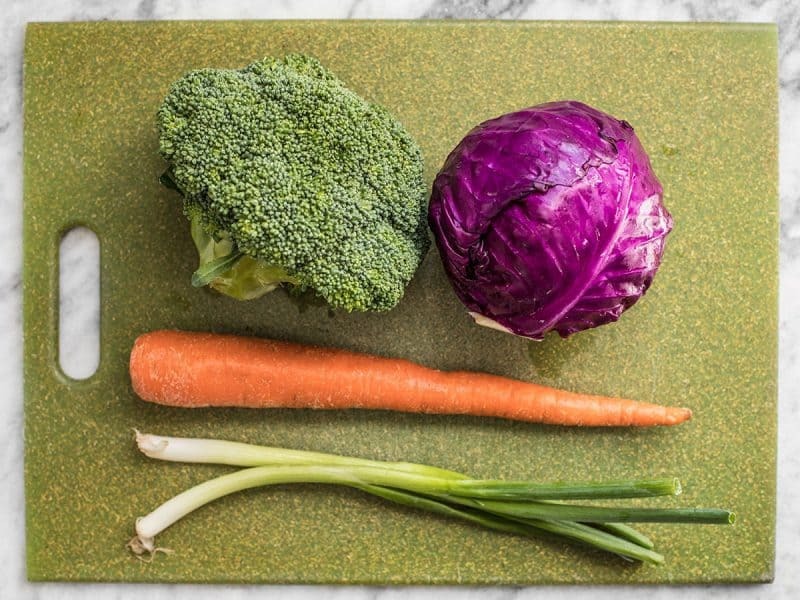 Because all of these vegetables have a fairly low water content, they hold up really well in the fridge (and have a great CRUNCH factor!). I only used half of that cabbage. FINELY chop the cabbage and broccoli. That is key. They need to be chopped into very small pieces! You should have about 3 cups of each once chopped. Peel and shred the carrot, and slice two green onions. Add all of those to a large bowl along with 1/3 cup unsalted sunflower seeds and 1/3 cup dried cranberries. Stir all of those ingredients together. 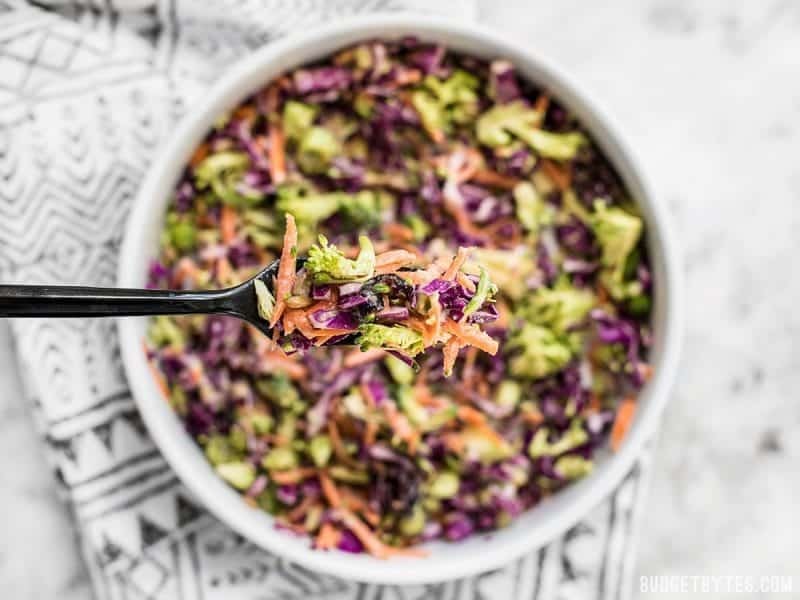 This mixture can be refrigerated and kept for about 4-5 days, which makes this a great meal prep salad! And then when you’re ready to serve, just plate it up and drizzle a generous amount of dressing over top! You really want a good amount of dressing on this one. With super crunchy, low moisture vegetables like this you need a liberal amount of dressing to help keep things moist. Plus it’s really yummy. Enjoy! Is this Tahini paste or SAUCE? I have had problems finding either,,, but what to be sure I am asking for the correct ingredient. I’m obsessed with this salad! The dressing is amazing. I’m going to make the dressing again for this week’s lunch and add it to a salad I’m making with hodge podge ingredients. WoW this is delicious. I subbed walnuts for the sunflower seeds because at the store they came in a pre-packaged mix with dried cranberries, and it was so yummy. I also could only find a tahini and lemon dressing, so I reduced the amount of lemon juice to a teaspoon and followed the rest of the recipe. It was so easy! I will definitely be making this again thank you! This was the first of your dishes I was skeptical of in ages, especially since I realized at the last minute that my husband had used all the maple syrup, so I had to sub agave. Will the salad hold up to the dressing over time, or should I wait to add the dressing until I’m ready to eat it? If you want it to stay super crunchy, keep the dressing separate. But if you prefer your cabbage a bit softer, you can definitely pre-dress it. This is such a delicious salad! All the flavors work together so well, the green onions in particular are an awesome addition. I love the dressing too. I added some spinach and some toasted spiced chickpeas to bulk it up a bit, and I used walnuts instead of sunflower seeds since it’s what I had on hand. I’m looking forward to having this all week for lunch. Thank you! Hi Beth! What’s a good vegetarian dish to have with this salad? Thank you!